Few would argue that the primary purpose of language is communication. Still, there is a vast difference between transmission and reception between two people even when they ostensibly speak the same language. 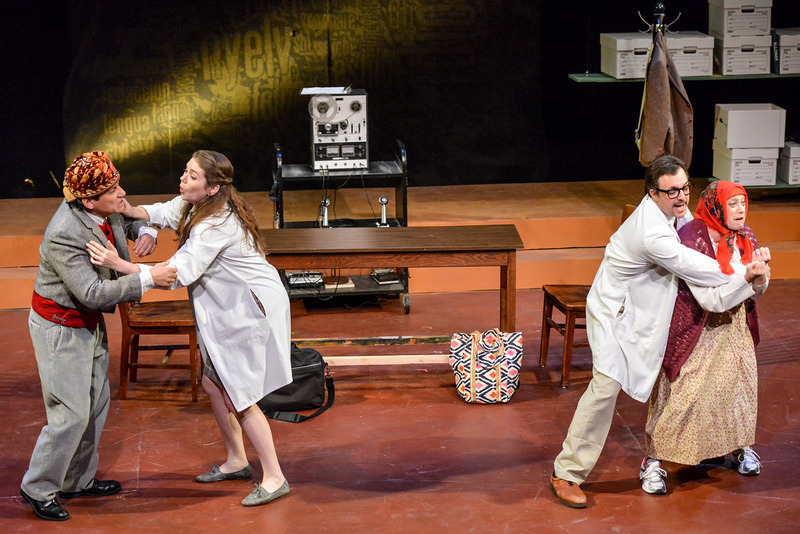 City Lights Theater Company’s current production of Julia Cho’s play, The Language Archive, takes a compelling look at the language of love vs. the love of language. George (Jeffrey Bracco) is a linguist, deeply buried in his studies as he tries to capture recordings of dying languages for his archive. Mary (Lisa Mallette) is George’s long suffering wife. Emma (Kendall Callaghan) is George’s able (and smitten) lab assistant. Alta (Deb Anderson) and Resten (Ben Ortega) are an aged couple from a remote village in a far-away country. They are two of the last speakers of their native tongue Elloway, a language that George had assumed died out half a century ago. In addition to Alta and Resten, Anderson and Ortega also play a number of secondary roles. The most prominent of those is Anderson’s German professor persona. In that role, she’s Emma’s Esperanto instructor. George is fascinated by the study of language including the unique sounds and the myriad meanings in even the most innocuous phrase such as, “Will somebody please take out the garbage?” He is also desensitized to the various emotions wreaking havoc in those around him. Mary, on the other hand, is his opposite number. She sees the world through her emotional reactions. George cannot understand why Mary weeps at the slightest provocation, while she can’t fathom how he can go through life and never shed a tear. In exasperation, Mary announces she’s leaving George. At the same time, George and Emma bring the Ellowans to the lab to attempt to get a recording of them speaking Elloway, but all Alta and Resten do when they get there is argue vehemently in English. “English is the language of anger,” Alta says by way of explanation. And so it goes. The script’s primary story arcs are thoughtful and reflective. Humor is written into the script in places, but it is sometimes fleeting, merely providing a light moment to keep the play from becoming too dark. Other times, the humor is more plentiful even entering the world of slapstick. Virginia Drake’s direction enhances the script’s flow. There are numerous monologues by various characters at key moments, intended to be delivered directly to the audience. Drake’s staging makes those moments very intense. Her cast is extremely experienced and capably carries this off while keeping the story very believable. In addition to the actors, Drake makes use of stage hands donning lab coats to execute set changes that blend directly into the action. Mallette is very smooth and fluid as Mary. Bracco’s character is more stilted by design. One would almost get the impression that George is either borderline Asperger’s, or an emotionless wreck. The interactions between Mallette and Bracco are intense, and clearly show that just speaking the same language doesn’t guarantee communication. That point is hammered home late in Act 2, close to the story’s resolution, and their scenes together are heart-wrenching. Clearly George has a love of language from an analytical point of view, and he loves Mary. Alas, he cannot find the words to tell her in an understandable fashion, and Mary doesn’t speak “George”. Callaghan’s Emma has difficulty getting George’s attention. George sees her as an able assistant and scientist, but he cannot see her for anything more. As a result, Callaghan brings an energy and angst to Emma that is almost palpable. Her scenes with her Esperanto instructor are informative, and through humor, Anderson uses Callaghan as a foil for some truly zany moments. Anderson and Ortega are wonderful as Alta and Resten. The fire in their arguments is infectious as they charge at one another, ready for bear. Then they switch gears and come to each other tenderly, as a devoted couple deeply in love. Both Anderson and Ortega clearly delineate their secondary characters as well, but while Anderson’s transformation is complete, both physically and audibly, Ortega’s is mainly physical through his carriage. His character dialects aren’t as distinct. The story takes place in several locations such as the lab, George and Mary’s house, a classroom, a shop, and even a train station and street. These are all clearly depicted with minimal set changes. Ron Gasparinetti’s set design includes several shelves stage right and left filled high with file boxes reminiscent of a miniscule piece of the warehouse shown at the end of the movie, Raiders of the Lost Ark. There’s a door stage right that serves as the entrance to the lab. There’s a useable platform above the door stage right with more file boxes stacked upon it. A rolling chalkboard is placed in front of the door when Anderson assumes her professorial role. The table serves many purposes and is moved to conform to the lab, the house, the classroom, and finally, the shop. There is a fixed drop upstage center covered with words meaning language or linguist written in many languages. George Psarras’ sound design is spot on. His soundtrack provides the expected train whistles and sirens along with many other well-suited background noises and effects. He also includes some mood appropriate music for scene changes and underscoring during the more dramatic segments of the play. The music has a classical feel with some very contemporary influences in its use of timbres ranging from piano sounds, to harp and gentle percussion. The music accents the emotion within the scenes, greatly enhancing the moment. The story travels a not unexpected path and ends not in joy, but in a satisfying, yet partially mystical and contemplative state. There is depth to the story that will spawn discussion and private reverie of how love and language intertwine. This production is well worth seeing as it continues through June at City Lights. When: Thursdays – Sundays through 29 June.